I look forward to December in Chicago every year; not because I like the cold and snow but because of all of the activities packed into the month. There’s so much to do in the month of December with many events being free or low cost so most can take advantage of them! Here’s a list of can’t miss activities happening during December in the city! 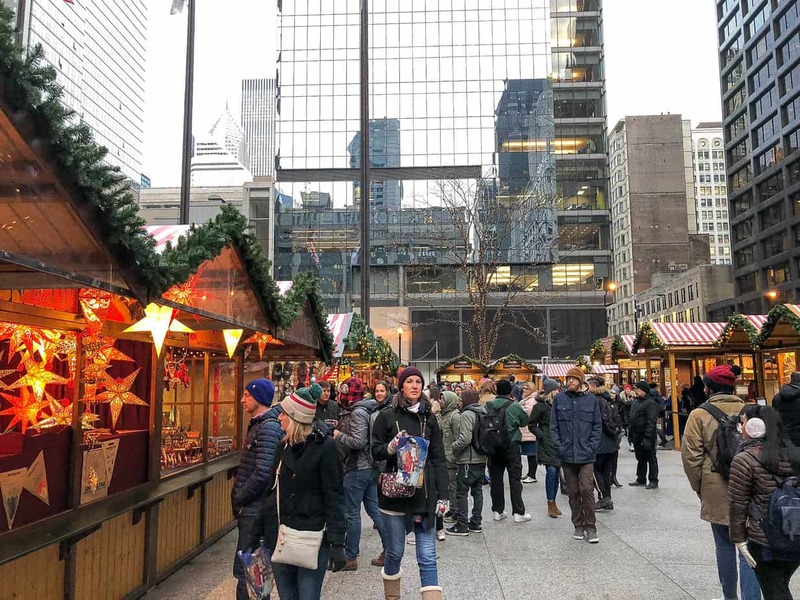 Inspired by the Christkindle Market in Nuremberg, Germany, this free outdoor market takes place in Daley Plaza. Explore German food, drinks, shopping, and entertainment thru December 24th. You can also catch the market in Naperville. Entry into the Christkindle Market is FREE. Browse hundreds of handmaid one-of-a-kind items from over 600 artists at The Mart December 6-9th! Tickets start at $12 or choose from ticket packages starting at $18. Pro Tip: If you sign up for emails from some of the featured artists you can score free tickets. Shoppers will have the opportunity to meet and engage with participating artists to learn about them, their creative process, and their work while shopping art, fashion, jewelry, wood, photography, glass, furniture, home goods, pet products, bath & body, and so much more! Everything you’re looking for in one place! Take in the skyline as you skate the ribbon at Maggie Daley Park. This family-friendly activity is always a highlight of winter in Chicago. Hop on the Jolly Trolley to shop the Blocks of West Town during Winterfest on December 8th. Over 20 retailers will feature special promotions, one-of-a-kind items, and trunk sales. The guided tour lasts 3 hours, features all the shopping blocks and provides a “checked shopping bag” service, so you don’t have to worry about your gifts while you shop. Receive a $20 Gift Certificate when you purchase a $10 Jolly Trolley ticket. Adult beverages are provided during the trolley ride. The one-of-a-kind experience offers fun, free, family-oriented festivities, and hundreds of dynamic displays all under the glow of 2.5 million lights. Zoolights is free entry. Hop on board AMTRAK’s Polar Express taking off from Chicago’s Famous Union Station! This is the only time it’s acceptable to wear your pajamas in public, since guests are encouraged to come dressed in their PJs, lol. Each 3-hour memorable ride includes live entertainment, delicious hot chocolate, a cookie, and a keepsake. Winter WonderFest at Navy Pier is an annual Chicago winter event, featuring 170,000 square feet of carnival rides, giant slides, holiday-themed activities, and Indoor Ice Skating Rink, and more. Walk a mile long paved path amid a multitude of colors as interactive lighting effects highlight the beauty of trees in winter. Enjoy seasonal music, stare in amazement at the ever-changing, interactive lighting designs, and warm up by a crackling fire with a cozy drink or roast marshmallows for s’mores. Purchase tickets here. The WINKY LUX EXPERIENCE is a pop-up inside The Shops at Northbridge There are seven Instagrammable rooms waiting for you to let loose and get creative in. I think the guys enjoyed it just as much as us ladies. The tour is free but you may want to pick up some of Winky Lux’s cruelty-free beauty products while you’re there. Take in the New Years Eve Fireworks Show over Lake Michigan on December 31st starting at 12 a.m. This event is free! We spent some time in Chicago last year in December and LOVED our time in the city. Pinning this for reference as we must visit Chicago in December again. Thanks for sharing. You’re so welcome! Happy to hear you enjoyed your time in the city!